So, Thursday night I went to see Mockingjay. A bunch of us from school decided to go, do that whole sit against the wall and chill for two hours before opening type of deal. I was decently excited for the movies. I read the books and hadn't been super impressed. 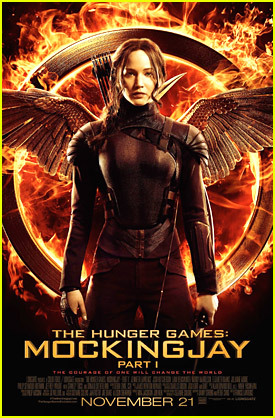 The first one was interesting (even if I was reminded of the Battle Royale plot), the second very similar to the first, and the third, well Katniss wasn't super passive, but nor was she amongst the most important part of the world's action. I felt like things were seen from the side and from far away. But back to the premier. A lot of my European classmates were excited because, well, cuz it's the Hunger Games. I sat next to a Venezuelan friend while waiting and why she loved the books just blew me away. At its heart, you could say Collins's novels are about the mass uniting to challenge a corrupt government. As an American, I'm familiar with this. It's in my history. It's in the movies and books I see. To me, it's a troupe. There's nothing special. But to her, it was a model. An idea, motivation. Venezuela is having a lot of political problems right now (some of which is drastically affecting students here and if you want to find out more/help her, please do so) and reading a book about a nation rallying together resonates with her a lot more than me. The idea, the themes, "this is what we want to do." I know SF/F has been used as allegories for social issues for ages and hey I've read some as such myself. But these things I take for granted - freedom to petition, to be heard, to be lead by who I want (other voters depending) - I never see them in the fiction I read. Or rather, I don't place as much as an importance on them as others. They aren't the 'meat' of the story. No wonder international markets really are huge for American media, they have this whole new understanding that's applicable as soon as they set down the book or walk out the door. I've always known books and films to be powerful, there are some that will never leave me too, but I've never thought about it in this way before. That it could inspire the mass. That it did in Thailand. Seeing thing from a new perspective...I love the sense of the world shifting and changing, the feeling that I suddenly got 100x smarter. I love learning, period.